I was in Cambodia last week, and it was stunning. It was a little more crowded than usual, from what I hear, because of Chinese New Year, but it was a good time to go. It’s now back to work and normal routines. Cambodia is flat. Huge sky. Urban landscapes can be only 3 stories tall except for a few temple spires, they don’t need skyscrapers. The dry season is very dry. And hot. It is dusty and flat. It’s easy to get a visa at the airport, though difficult to find the queues as they are more like blobs. Checking in at the airport takes 5 minutes, including passport control on the way out. The temples are spaced out, kilometers between. There are moats around temples. The genocide museum is in an ex-high school, which was repurposed to torture and imprison Cambodians. It looks eerily similar to high schools where there are actually students. The roads in Cambodia are bumpy. Look out the window, you might feel gross. 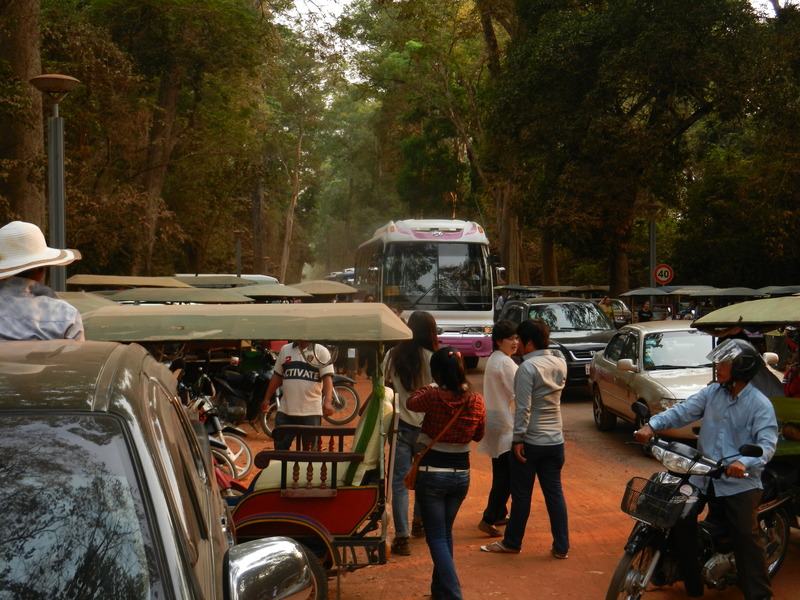 The mini-bus takes 5 hours to go from Phnom Penh to Siem Reap. The regular bus takes 7 hours. The mini bus passes every vehicle in front of it. Sometimes frightening, bouncy, and unsettling, but quick. We had a flat tire in our tuk tuk, and then our driver found passing motorbikes, paid them 3$ each to drive us the last 6k to the boat to float through a city of palm tree houses on stilts. Most people live in one roomed dwellings on stilts. There is a giant lake, that floods for half the year. There are millions of tourists in Angkor Wat, and only a few in the other temples. Go a few kilometers further. On a tuk tuk, don’t take a bus. According to the tourist Police, scarves are disrespectful in religious sites. Who’d have thought? There are more dreadlocks on white people in a single temple in Siem Reap than there are in the whole of Hong Kong. Flowing dresses are the best-it was 95°F in February. Everywhere is more crowded on Sundays. If you want to see the sunset, you have to get there before 4:30 to get a good seat. Then wait til 6:30. Bring beer and water, maybe some snacks. Stay in Siem Reap at least 3 days. Read something light-like chick lit. Anna Karenina just doesn’t go with Buddhist temples in the jungle. 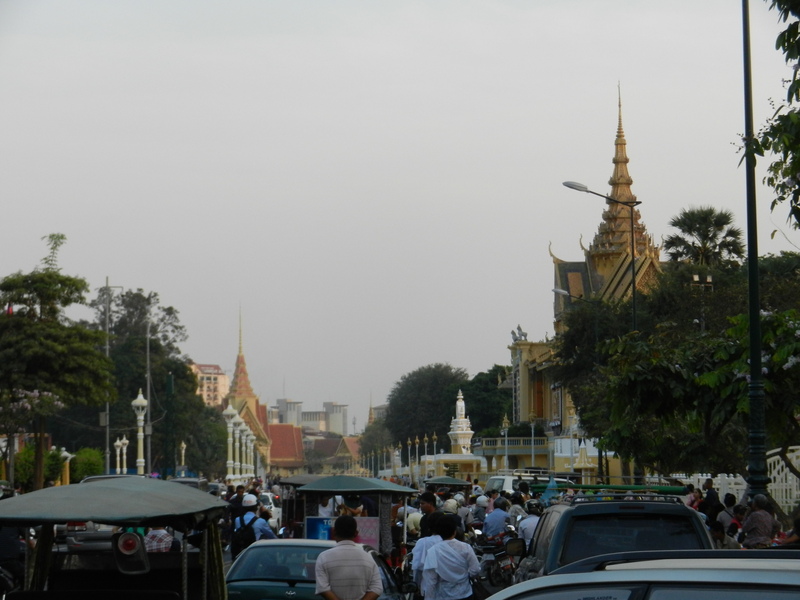 Cambodia is “beguiling.” thank you, Footprints guidebook, for the lesson in vocabulary. people sell you things cheaper at the monuments than they do in town. 1$ for 10 postcards, 2$ for a scarf. In town: 5$ for a scarf is the starting price. Bargaining is easy when you know the fair price. And when that price is 3 dollars. Boxers make good fishing attire when it’s 95°F. Especially in the shade of a floating forest. There were more things. I may elaborate on them later. I thoroughly recommend going if you come anywhere near south east Asia.